Servings: Makes several bowls, depending on portion size. Preheat oven to 350 degrees. On a baking sheet lined with parchment paper, drizzle carrots with olive oil, salt and pepper. Roast for approximately 40-50 minutes. Slice the sweet dumpling squash and lightly drizzle with olive oil, salt and pepper on separate baking sheet. Roast for about 30-40 minutes or until tender. Note: Since this type of squash has thin skin, I left it on but you can peel if preferred. Whisk together the ingredients for the salad greens. In a large bowl, toss the kale and shaved Brussels sprouts with the dressing (you may not need all of the dressing). Use your hands to massage and mix together well. Set aside. Bring one cup of quinoa (rinsed) and two cups of water (or broth) to boil in a medium saucepan. Reduce to simmer, cover with a lid and cook for 15 minutes. Remove lid and fluff with fork. In a skillet, heat 2 Tbsp of olive oil. Add the chickpeas and fry on medium heat for approximately 10 minutes or until golden brown. Using a slotted spoon, remove the chickpeas from the pan and set on a paper towel. 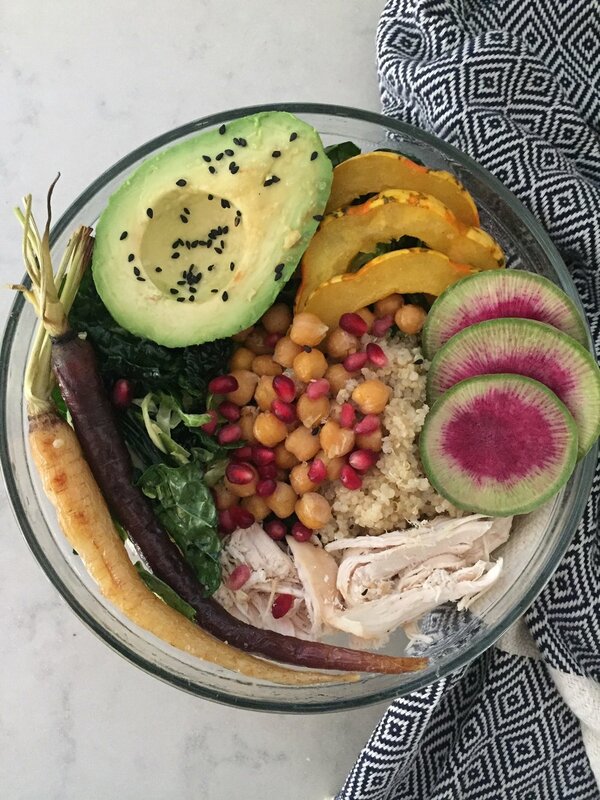 Build your bowl! Add the greens first as the base. Top with quinoa, roasted squash, carrots, cooked chickpeas, avocado, radishes, pomegranate seeds, and any additional toppings or dressing if desired. Enjoy! Recipe by Ascend Health Coach Ashley H.